A gene mutation commonly called UBTF is what is taking our daughter’s brain. Addison is a 10-year-old beautiful, blue-eyed girl with the best smile a little girl could have, and a laugh that the world laughs with. We knew our daughter Addison was special and rare, but we didn’t know how rare. She is one of 10 in the world with this rare gene mutation. Addison had some hiccups at birth, but nothing too alarming. At about 18 months old we started to see some red flags with regards to her speech. 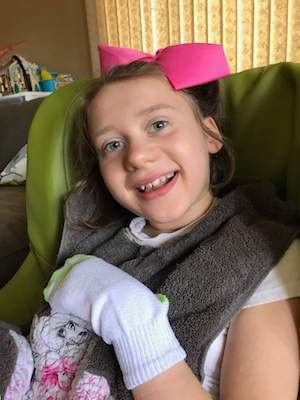 She was then given a diagnosis of Autism at the age of four, and in that same weekend she was also diagnosed with Cerebral Palsy. We were so lost and confused, but never lost sight of the fact that no diagnosis would change our baby or how we loved her. We continued seeking answers through many specialists, some who were mean monsters who forgot there was a child and a scared family on the other side of that cold doctor’s office. Others were lost and confused, constantly saying how cute Addy was and not to worry. Yes, we know how cute she is, but HELP US! Life was very stressful, between fighting for answers, fighting for her needs, and watching her decline before our very eyes. We are lucky to still have her with us, as we were told by one of those cold doctors to “go home and enjoy your baby.” As if we weren’t doing that every single second of every single day, but with no info, no next steps to help her, no full diagnosis, it was challenging. Looking back, that doctor was in over his head and I put him on a pedestal and that was unfair to do. UBTF mimics Amyotrophic Lateral Sclerosis (ALS), often called Lou Gehrig’s disease, which causes progressive neuromuscular decline in adults. Like adults with ALS, Addison began as typical: walking, talking, eating, playing. But then she began to decline. UBTF is a genetic mutation, found out by a genetic blood screening, which causes brain atrophy. Who knew that this tiny section of her DNA could be so debilitating? Around the same time, on a parallel path in all different parts of the world, 10 or so families were also being given the same devastating news with not much help and not much information. We needed to be the guide for each other; we are 11 families that will forever be linked together. Our lives were starting to change; our worlds would never be the same. Some of her changes came faster than others. Behind every change her persistence and fight existed. She started needing a pull-behind walker at about age four, and within two years she was using a full-harnessed walker. At first she was eating like an 18-year-old boy, and then she needed food cut smaller, then pureed, and finally needed a feeding tube. She is at high risk for aspiration so she is fully G-tube fed. She now chokes on even her saliva. She was struggling to stay at 40lbs as an eight-year-old; in two years with the G-tube she’s gained 40lbs! One of the best decisions we’ve ever made. Today she is fully reliant on a wheelchair, barely makes any sounds other than squeals of happiness once in a while, and has little control or capabilities with her body. Addy is slowly slipping out of our grip. We went from being a family fighting for her needs to a family fighting to keep her comfortable and give her the best quality of life. You spend all this time fighting for something you want so badly, a typical kiddo, but then you realize the gift is right before your eyes. We now live to give her the best quality of life, lots of comfort and love, and in return we hope she keeps giving us smiles and giggles. I was pregnant with our second when we started scratching the surface of our fight. After Raegan was born, they loved playing with each other. Addy would crawl into all of the baby toys and Raegan would just look at her in awe. We decided that as Addy was having more difficulties that we didn’t want Raegan to be alone after we were gone. We decided to have a third child, and with that we were given a spitting image of Addison, named Megan. Megan is smitten with Addison and is a total caregiver. Raegan is the helper and is constantly jumping in. They will never have a typical life, but they will be able to say they have an angel here on earth, our Addison. My husband and I always joke when people complain about some of the troubles with their kiddos. We aren’t minimizing anyone’s struggles at all. We just wish Addy would cause trouble; we wish she’d sit up and swear at us. Oh, to hear that sweet voice again, to feel those sweet lips on my cheek, to have her climb up in my lap with a book for me to read, to feel those arms around my neck and squeeze me tight. Oh, how I miss my baby girl, the way it was. We have been through the stages of grief more than once: denial, anger, bargaining, depression and acceptance. A couple of the stages have stuck around longer than I’d like to admit. Someone doesn’t have to die to go through grief; anticipatory grief comes with tremendous loss. We can look back a week and find she’s lost another skill or capability and start the grief cycle all over. The years are painful because they show so much in her smile, her walking, and the decline in all her abilities. We always say we wouldn’t change most things because it makes us who we are, but if I had one wish, any wish, I would go back and get rid of the disease in a heartbeat. What keeps us afloat is her ability to wake every morning and fight another day. She is our sunshine! She’s taught us and continues to teach us so much in her 10 years! The changes, the fight, and my wish are all part of the endless and viscous cycle, but one I wouldn’t know what to do without. Addy, we love you. YOU ARE OUR SUNSHINE! 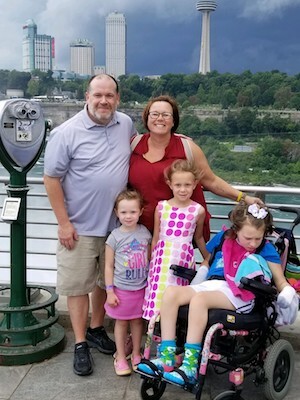 Christine Cannon is the family coordinator for a hardworking husband and three awesome girls. She is also the author of a blog, Sunshine for Addy. Kids with Complex Needs Can Stretch Their Wings at Summer Camp!